Homeschool Creations: Itty-Bitty Bookworm Giveaway!! I've been blessed to be able to host several giveaways for you all, but this one is for a full year of Itty-Bitty Bookworm's preschool curriculum (a $300 value!!). Please read through this review to see how to enter to win! Before deciding to be a stay-at-home mom and homeschooling, I was a preschool teacher. I know how much time and effort goes into planning a week's worth, let alone a year's worth, of curriculum in both the classroom setting and at home. I wish that I would have had Itty-Bitty Bookworm YEARS ago because it would have saved me so much time and energy! I have been 100% impressed with all that has been poured into this preschool curriculum and what it offers for both teachers and children. 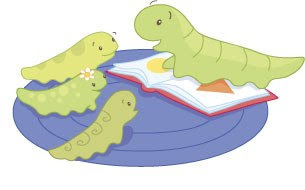 Itty-Bitty Bookworm is a literature-based curriculum for preschoolers ages 18 months to 5 years ~ and everything you need is provided for you! The plans would work well in any teaching setting, from homeschooling, in-home daycares, or large school settings. It was developed by several early childhood educators and is extremely well-organized. The literature used as the base for the curriculum includes great books such as The Itsy-Bitsy Spider, The Wheels on the Bus, The Best Mouse Cookie, Silly Sally, The Gingerbread Man, and Mouse Paint. Bailey's curriculum (ages 18 to 36 months) focuses on two different books each month and Bo's curriculum (ages 3 to 5) focuses on four books each month. The activities and projects for the lessons revolve around the stories that are being read with the children. Just to give you an idea of how complete and thorough the plans are, the lesson plans for the month of February (Year 1, Bo's Curriculum) are 265 pages. The plans provide an abundance of craft ideas, games, rhymes, finger plays, printable books and activities. In addition, the curriculum provides supply lists, newsletters for parents, monthly objectives, milestones for children, daily report forms for children, and observation record sheets. The lesson plans are laid out in a simple-to-follow format (you can see a pdf sample here) and you have the option of using as many or as few of the ideas as you want. The lessons are completely flexible. When we used them I was able to adapt different projects quickly to what we had on hand, but had the great framework that Itty-Bitty Bookworm provided. Baily Curriculum (for ages 18-36 months) and book lists for Year 1 and Year 2. You can also view a sample lesson of Five Little Monkeys. Bo Curriculum (for ages 3-5) and book lists for Year 1 and Year 2. You can also preview a sample lesson of Mushroom in the Rain. If you'd like to see how we used the curriculum during our homeschool day, you can find pictures and more details in a few of my Preschool Corner posts: the letter S and the letter W.
Itty-Bitty also has Bible Story Units that can be used a supplement to your curriculum or as part of a Sunday School curriculum. The Bible units include a verse coloring sheet, mini poster and 3 days of lesson plans along with other activity ideas. Tara, the founder of Itty-Bitty Bookworm, also has a blog, Raising Itty-Bitty Bookworms along with free resources for parents. If you are interested in ordering Itty-Bitty Curriculum, you can choose to download a month of lesson plans ($20 each month) at a time or order a CD-rom ($25) of plans. Itty-Bitty also offers a 10% discount if you purchase a subscription of 3 months. Yearly subscriptions receive a 15% discount. You will get your money's worth out of this curriculum and will not be disappointed! The Itty-Bitty Bookworm has kindly offered to give one of my readers Year 1 of Bo's curriculum on CD. If you would like to enter to win this great curriculum, leave a comment here letting me know what you like most about this curriculum. If you would like to earn an extra entry, create a post on your blog to let others know about the contest and then come back here and leave another comment letting me know about your post. The giveaway is open until Thursday, April 2nd at 8pm and I will announce the winner on Friday the 3rd. Please be sure to leave a way for me to contact you, otherwise I will draw another winner. This giveaway is now closed - thanks so much! I have considered purchasing the Baily Curriculum for my son (who is 21 months old). I have reviewed the samples and love how they describe the prep work that you need to do ahead of time for the craft activities. I also love the organization of it all. Although I am not a stay at home mom, my mother-in-law is home with my son during the work day - this would be such a great program for both of us to use with him. Love your blog - and all of the ideas you post. Ooops, my response was lost! Trying again. Wow, I could really use this for my 4th child turning 4 in August. I was already planning to begin officially doing preschool with her then. She already listens in to much of the bigger kids' schoolwork now, and she has more than once found a backpack, put it on, and announced, "I'm going to school!" What do I like? The simplicity, the incorporation of children's literature, and the option to purchase the Bible supplements-- which I would have to do! I hadn't heard of this curriculum, but it sounds like it would meet my current preschooler's needs! And later, my 5th child's needs! Thanks for giving us a shot at winning this. I like the thoroughness I saw in your reviews of it, and I like that it has lots of different activities for the different books. Keeping my fingers crossed I win. I'll try and get another post by blogging on the contest. I would love a chance to win this for my almost 20-month-old. It would be so nice to have some lessons planned out and ready for her to "do school" along with Big Sis. I really like the thoroughness, which makes planning easy, and the fun creativity of the activities. I love that it centered around literature. I love how detailed and easy to follow it appears to be. I would love to use this curriculum with my daughter as I plan to homeschool her for preschool. I LOVE that it features old favorites as well as other books that children can fall in love with!! I have actually considered using it after we finish up BFIAR with my 3.5 year old! LOVE it!! Fun, Fun, Fun with learning included!!!! It's all inclusive which can be hard to find. You can study one topic using different subjects (math, science). It also has a Bible curriculum which is great! This will be my first year of homeschooling and it's good to know that there are good resources out there in one place instead of having to look at several websites for what you want. I'd never heard of this before, but it sounds like a great program. My 3-year-old has caught the school bug...every 5 minutes he wants me to give him something to do for "school," but he really needs his own thing. This sounds wonderful! What I love about this product is that you have the option to purchase small parts at a time. I don't want to spend a lot on one curriculum only to find that my little one decides not to like it 2 weeks into it. This way you get to "test drive" it and see if it works. Oh- I've been waiting until today to read about the give away!! I am so impressed with the Itty-Bitty Curriculum!! I'm starting an in-home preschool next year and plan on using this curriculum. I taught elementary school and 1 year of preschool before deciding to stay home full time. I've researched TONS of preschool curric. and haven't been too impressed until coming across Itty-Bitty. That's actually what motivated me to start my preschool. It's very literature based and thorough! I don't have to spend all of my "extra" time (ha ha- what's that??) planning my lessons. It's done for me. And in a very quality manner. So, I'd LOVE to win a year of BO's curriculum. Then I can use the money I have set aside to buy the curriculum to instead spend it on lots of fun materials to add to my classroom! I never heard of this before but it looks fabulous! I downloaded the samples and I can't wait to try them! It looks very organized and user friendly. I'm thinking I might use some of the Bailey units with my son who will be turning 4 next month, but who is language delayed. They lessons seem short and attention-grabbing, very hands-on--just right for him. I did a review on the curriculum i liked it just don't have the extra money! I'd love to try this with my son who will be 3 in July and my daughter who will be 5 (but is very young for her age) it would make them feel much more included in the school time I do with my oldest. Great giveaway! WOW! This looks fabulous. I'm not sure what I like best. I love that is it centered around literature. I love that the lessons are short, direct and FUN! I love that your supply list is there at a quick glance. I love that SO much is included touching on so many subjects and learning styles. I had never heard of this. Thanks for sharing and for such a great giveaway. ok - so its on a CD or a download? that is so great, then i can store it on my computer and not on my bookshelf - if you know what i mean. hundreds of ideas to chooses from? another great thing. i love picking and choosing. i am hoping to not leave my youngest (of 12 kids) out of homeschool in the fall. something as easy as this would make him feel loved like the other kiddos. and i must say my absolute favorite part about this curriculum is that it is literature based. can't get any better then that. oh yeah - another thing - i teach the littles at church - drawing from your review it's gonna work for that too - awesome! This curriculum looks fantastic! I love the literature based approach and to have something like this, with all the work done for you, would be so wonderful. I have left a link about this on my blog as well: http://blog.unitedteaching.com. We homeschool our oldest but with 2 preschoolers coming up I am on the look out for a good program. I really like this. I need to have every thing laid so I can easily know what to do. I like that they have shared reading, creative arts and a group activity. This looks like a wonderful curriculum and definitely something I could use! The biggest attraction is that it is so organized and everything is right there for you. I love it when people develop curriculum with a busy parent in mind! Also love the flexibility and being able to pick and choose what works for your child. The learning center ideas are a plus too. I homeschool my son, work part time in the evenings during the week, and run a homeschool business sprinkled in between everything else. Sometimes it gets quite hectic and this type of curriculum would definitely save me time in searching for materials to use with my daughter. This would make a great first curriculum for her! I first read about this curriculum in another blog, but I looked at it more closely after reading your description. It looks like a great curriculum. I love how a lot of the prep work has been done for you. Saves me a lot of time, but more importantly keeps me from feeling overwhelmed! I love that it is literature based! That is generally my teaching style around here. I would love to win this prize! I love that it makes planning easy and uses fun activities to the children interested. Sounds like an amazing program! It's base in literature fits with our homeshcool. And with a 4 year old and 2 year old it was would be used alot! Free is always great, thanks for doing this!! I love the list of what you will need for the activities, esp the cooking ideas. I've been looking for ways to let my oldest help out more in the kitchen. And the Bible circ looks wonderful. I've been looking for something that's already put together like that for my son and this is great. I love ANYTHING that is organized for you that helps you focus on your CHILD and NOT on the curriculum. I love that this approach is LITERATURE based because, I believe, ANY child can learn ANYTHING through a rich reading program. Having the opportunity to expand on the areas you cover from reading are only icing on the cake! They have clean lines, don't ask for items that are impossible to have on hand, their activities range from creative to edible (who doesn't like to incorporate some themed, yummy treat into your activities?). Creativity abounds in this curriculum! LOVE IT! ps, this time it came up with my Google already logged in, but still no anonymous option... ?? What an amazing curriculum! I love how much it is broken down by the day and that the activities build on each other from day to day. Even if I don't win this I'm so thankful I'm aware of it now! Thank you for all you do! This looks awesome! What I like most about this curriculum is that so many others are finding so many wonderful things about it! I think we would love it for the literature based themed lessons that are all planned out for you. The printables looks great too. It looks too cute and too fun! I love that it centered around literature. I love how detailed and easy to follow it appears to be. I would love to use this curriculum with my son and daycare kids as I run an inhome daycare. When I mentioned to my friend, Hope S., that I was interested in homeschooling my two girls, she directed me to your blog. Since then, I have really enjoyed your thoughtful entries, which has inspired me to do even more research on the topic. Itty-Bitty Bookworm offers the most comprehensive curriculum available by providing a learning environment that kids can wrap their minds around. Having all this at my fingertips (including the Bible Story Units) makes it that much easier to invest and diversify my kids education! here is the blog post...had to post it on facebook, just opened the blog up! love it!! i lov ethat it has so many activities and that it tells you exactly what to do and exactly what to say - right up my alley!!!! this sure would be fun!! I love how it uses literature! The book list is really awesome! I'd enjoy using it with my preschoolers and toddlers. What a great giveaway! I love that it is literature-based and it looks perfect for my pre-schooler! Thanks for the opportunity. Just finished posting the contest on my blog! I think this looks like a bright, well organized curriculum that would whet my three year old's appetite. She actively colours while her older sister homeschools but she needs a little more now that she's getting older, The convenient preparation of the program is a strong asset and would greatly bless this mom of three. Of course, I'd be glad to pass recommendations to other moms that appreciate a good Biblical and literature based unit too! My kids are 3 and 2 and we are just beginning our homeschool journey. However, as it is I spend a LOT of time each week doing prep work for only about 45 minutes of "school" time everyday. I am fearing my house is starting to show my lack of attention. What I love most about this cirriculum is that it is ALL done for me! I looked at what was included on the CD's and I was amazed! I just posted about the giveaway on my homeschool blog as well! Thanks! This is a GREAT giveaway. Heavens, I could give you a million reasons why I would *love* to have the Itty-Bitty Bookworm curriculum. (And another million for why we can't afford to actually buy it right now. But I think most everyone is in that same boat with me right now!) The short version is that although I have always been a stay-at-home mom, I really struggled to learn to love it. The whole kids thing didn't come naturally to me the way that it did to my mother or my sisters, so it has taken years of hard work and prayer to really learn to love what I do. (If you really care, you can read about that here: http://samueljanae.blogspot.com/2009/02/this-i-believe.html) I finally developed a passion for motherhood, only to find that I still had to struggle to find things to do with my kids. (If you are bored, you can read about my SuperMom Quest here: http://samueljanae.blogspot.com/search?q=supermom+quest). I have been in search of a good pre-school program that I could do with my (nearly) 4, 2.5, and (nearly) 1 year-old children. This seems like the PERFECT solution. It is simple and direct (perfect for the I-can't-think-of-these-things-on-my-own types like me) and it spans the whole range of my three kid's ages. I like that this curriculum is literature based. I like the "book of the month" lists! I never seen this program before so I took a little time to review their website and the products. I really like it. I like that they make it do-able for busy stay at home, homeschooling moms. I love how they really focus on books and reading. Great! What an amazing giveaway! I was just thinking of purchasing this today. Isn't that neat how GOD works! I love a book based curriculum and after looking at the samples, its just what a busy mom like me needs! I like how they have a weekly schedule for younger ages. It all looks so good and my two younger boys would love this. Thanks. I just came across your blog from a friends, and I would love to win this! I have 4 kids, 5 1/2, 4, 2, and 4 months. They are all still at home, and I try to do preschool, and you've given me a lot of good ideas. Please count me in for the giveaway! My husband and I just decided today, through much prayer and seeking, we are not sending our daughter (who will be 5 in September) to school this fall. While there is great peace and relief in doing what God is asking of us, there exists a sense of fear and trembling at the thought of teaching your own child at home (as I assume is the case for many new - and perhaps seasoned - homeschoolers). On this same day of gaining peace about our direction with schooling, I just “happened” upon your blog through Brimful Curiosities. I am confident your blog will be a great resource for and my husband as we take the homeschooling journey. As I looked through the sample lesson, what appealed most to me (and my sense of inadequacy) was how detailed the lessons are. I was particularly drawn to the step-by-step instructions in the Shared Reading section. As I begin to look for curriculum, I know I feel more confident at the start with more detail in the lesson plan. Thank you for sharing your adventures and ideas and thank you for this great give-away! I love that the Bailey curriculum starts so young. This would demystify the "where to start" in terms of teaching my now 16-month old. I just found your blog thru the welltrained and wow what a plethora of information. I have kids in both of these age ranges! I love that the curriculum is literature based and already planned out. I am really anxious about the homeschooling journey because I don't feel like i have time to plan! But this is already laid out, woohoo! Book of the Month is a great approach. What a great prize!! My son is 27 months...and it would be a perfect time for us to start the year 1 program with him!!! I'm a teacher....so I know how important preschool learning is!!! I love that it makes planning and prep work minimal, what mom doesn't love that! And that it is based on children's books is another fun aspect of it. I hope I win! Wow! I LOVE this site! I signed up for the newsletter! I like how easy it is to do with your kids! Very helpful! Oh my! Where to begin with what I like about this one? It looks so complete and right up my son's alley. What a relief this curriculum would be for this mom, who would like to homeschool at least two special needs children (4 total) and one hormonal teenager to boot! I'm a little overwhelmed with the idea of teaching my little language-delayed, autism spectrum guy who is such a sweet fella. It hurts to send him off to his new preschool where he's now picking up bad habits and even acting out at home sometimes. Itty Bitty sounds a lot like what they do with him at school but I could teach him at home instead! I'm counting down the days till this school year is over. I'd love to use Itty Bitty not only for him but for my 18 month old daughter as well. My son loves music and I love that Itty Bitty incorporates songs and poems into their curriculum. Again, thanks so much for the chance to win. This would be a great addition to our preschool class - love that it is literature based and provides flexible lesson plans (since we have a 3 day week). I love the ideas of this curriculum for little ones. It would help shorten the time planning for mine. I was so excited to find your blog. I have a 2 year old that I have been trying to set up stuff everyday from the internet and find it soooo time consuming. This is exactly what I have been looking for thank you.